The North American tour cast of “The Color Purple.” Photo by Matthew Murphy, 2017. The Tony Award-winning revival of “A Color Purple” has arrived in the nation’s capital at a pivotal moment in the fight against injustice and oppression, with a tear-stained, yet joyous message that the human spirit is resilient and transformation is possible. Growing up in rural Georgia during the first half of the 20th-century, fourteen-year-old Celie (Adrianna Hicks) is repeatedly raped by her father, J.D. Webster, eventually giving birth to two of his children. He gives the children away, leading her to believe they are dead. This is a must-see musical with a message that will stay with audiences long after they’ve left the theatre. Soon after, when the evil Mister (Gavin Gregory) comes looking for a wife in Celie’s pretty younger sister, Nettie (N’Jameh Camara), their father hands Celie to him instead. Mister abuses Celie and treats her as little more than a servant. Although Celie has experienced a lifetime of abuse inflicted by men, she is lifted up by women, the confident and strong-willed Sofia (Carrie Comperes) and glamorous blues singer, Shug Avery (Carla R. Stewart), who are instrumental in Celie’s coming to know and value herself. The cast delivers the score with purpose and conviction. Production highlights include Comperes’ portrayal of Sofia, whose uncompromising self-respect and fierce determination drive her to stand up for herself in the bleakest of circumstances, and Stewart’s (Shug) rendition of, I am sure is an audience favorite, “Too Beautiful for Words” sung with grace and sensitivity. Hicks (Celie), a standout by any measure, takes the audience on a searing journey of growing awareness, anger, and finally, empowerment, as she transforms from an abused young girl into a confident woman, culminating in a powerful performance of “I’m Here” that got the audience cheering. Marsha Norman’s book, based on Alice Walker’s novel, deftly tells a complicated story of multiple characters with intricate twists and turns, supported by Director John Doyle’s stark set and a hidden orchestra that weaves a tapestry of jazz, blues, and gospel style music as the story unfolds. This is a must-see musical with a message that will stay with audiences long after they’ve left the theatre. 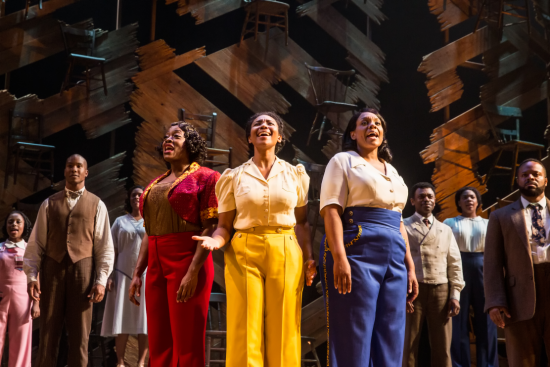 In a world still wracked by oppression, brutality, and discrimination, “The Color Purple” is a tribute to the innate dignity and worth of each person—whether the world recognizes it or not. Running Time: Approximately 2 hours and 20 minutes with one intermission. “The Color Purple” runs through August 26 in the Eisenhower Theatre at The John F. Kennedy Center for the Performing Arts, 2700 F Street, NW Washington, DC 20566. For more information or to purchase tickets, click here.